As anyone who has ever made or eaten matzoh balls knows, there are sinkers and there are floaters. You want the floaters. Not the sinkers. Trust me. Sinkers, well…you might as well go chew on some of the gravel left over from making Stone Soup. I made 3 batches of matzoh balls this week using 3 different techniques. I did not start this out as a science experiment. I just got lazy. All three techniques are based on the standard Manischewitz recipe. Technique 1 (my previous go-to method): The standard way to make matzoh balls, straight off the package. Mix matzoh meal with salt, add lightly beaten whole eggs and water, mix very well, let hang out covered in the fridge for about 30 minutes, then roll the dough by hand into small balls and toss them into a pot of boiling chicken soup. Let cook, covered, for 20-30 minutes. Result: Chewy sinkers. Not recommended. Technique 2: This one required some effort and multiple bowls. First I separated the eggs and whipped the whites to soft peaks (my arm got tired around the same time as my dinner guests conveniently showed up or I would have done medium-firm peaks), then lightly beat the yolks. After mixing the dry ingredients, I stirred in the yolks, oil, and seltzer water (instead of plain water or broth – I was going for leaveners), then gently folded in the whites. I mixed this just to incorporate everything, and not more than that. I let it chill about 30 minutes, and then scooped* them and cooked them in a pot of boiling salt water, covered for about 20 minutes. Result: The lightest, fluffiest matzoh balls I have ever eaten. Technique 3: This is where I got lazy, and it was a good thing I did! I kept the eggs whole, no fancy beating or whipping required. After combining dry ingredients, I lightly beat the eggs to break up the yolks and added the eggs into the dry ingredients along with the oil and plain water. I only mixed until incorporated, then chilled about 30 minutes. Then I scooped them and boiled them in salt water for about 20 minutes. Result: Not the absolute fluffiest, but extremely far from being sinkers. 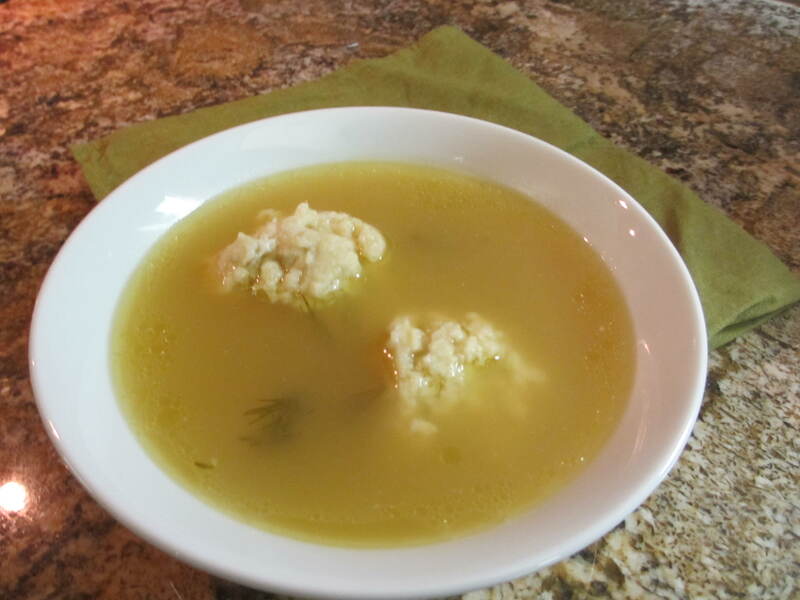 Matzoh balls are delicious served in a bowl of broth with fresh dill. This entry was posted in Cooking, Cooking Techniques, Grains, Recipes, Sides and tagged Ashkenazic, chicken soup, cooking, fluffy, Jewish, manischewitz, matzoh ball, Passover, recipe, Seder, shabbat, shabbos, soup by Amy Spindel. Bookmark the permalink.